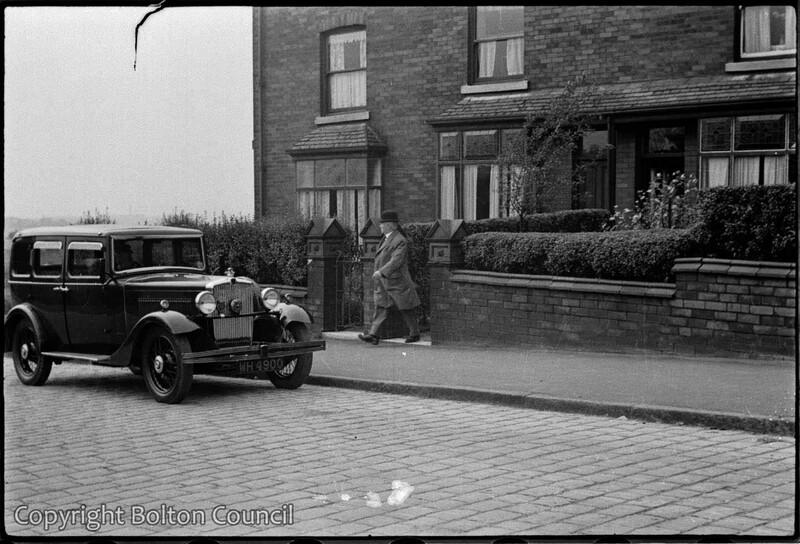 A car and man outside a house in Bolton. In the next photograph (1993.83.09.03) the car has gone so we can probably conclude that the man has driven it away. The photograph has been labelled in the past as being of George Tomlinson, the Labour candidate in the January 1938 Farnworth by-election but we do not believe this to be right. On closer inspection this man is older, and perhaps stouter than Tomlinson. After some discussion (see comments) it is possible that this may have been been taken on Long Lane facing the junction with Swinton Street. How about Long Lane, with the house on the left on the corner of Swinton Street. Have a look at Google Street View. Still the same window positions and types and the same garden walls and gate pillars? Blenheim Road is not shown on the 1:2500 map, dated 1937, so the semis to the left of these houses were probably built after this photo was taken. I make it a definite maybe. Well, thank you and apologies for missing the decorative gutter supports at the roofline. Can we do better than that? Possibly? This is like archeology without the digging. Where’s ‘Baldrick’ and friends, when you need him. These houses were built between 1894 and 1910 so you would expect some remedial work to be have been done, since then. Especially to the woodwork and those draughty sash windows. The brickwork seems to have stood up pretty well considering the houses were built within sight of (i.e. less than 400 yards) of the shafts of Breightmet Colliery, with Crompton Fold Colliery just over 1/4 mile away. Subsidence could well have been a problem. I wonder if that led to the Gable of the end house being rebuilt (see Street View) and the front being altered and pointed, if not rebuilt? That is the only house with the arch missing from the bedroom window. The others still have them. The coping of that garden wall looks decidedly ‘wonkey’ in the 1937 photo. Paper lads cutting corners?!?! It looks as though it was rebuilt, relatively recently, without the caps. I agree but didn’t that quote win an award from the Plain English Campaign? John Hutchinson a retired Ring Spinning Overlooker lived at that house according to the 1939 Census.